I hope you all had a lovely and peaceful Christmas. I sort of got there in the end – this Christmas has been the most disorganised ever for various reasons. In the end, I only sent cards to friends who live away from us. I was still wrapping presents on Christmas morning, and even Boxing Day morning for relatives we were going to visit later on. No matter – the world didn’t fall into two separate hemispheres. We had a big wedding in the family last August, so we gave a number of relatives framed photos of Edie and Bee who were bridesmaids. Bee had her prom in July, so a picture of her in her lovely red dress provided another frugal present. Last year I made almost all of my presents, but with everything else going on it proved impossible to match that effort this time. 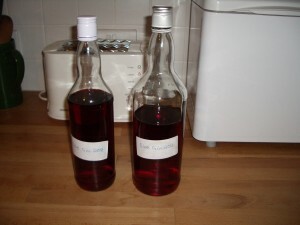 Some of you will remember my very first post about making sloe gin. I bottled it up on Christmas Eve (after a taste test of course!) and gave small bottles as extra presents to the grandparents. So how did the sloe gin turn out? You might remember that I made one batch with basic supermarket gin and one with standard supermarket gin. I actually preferred the one made with the basics gin (the bottle on the left of the photo) – it seemed smoother. How did your homemade presents work out?